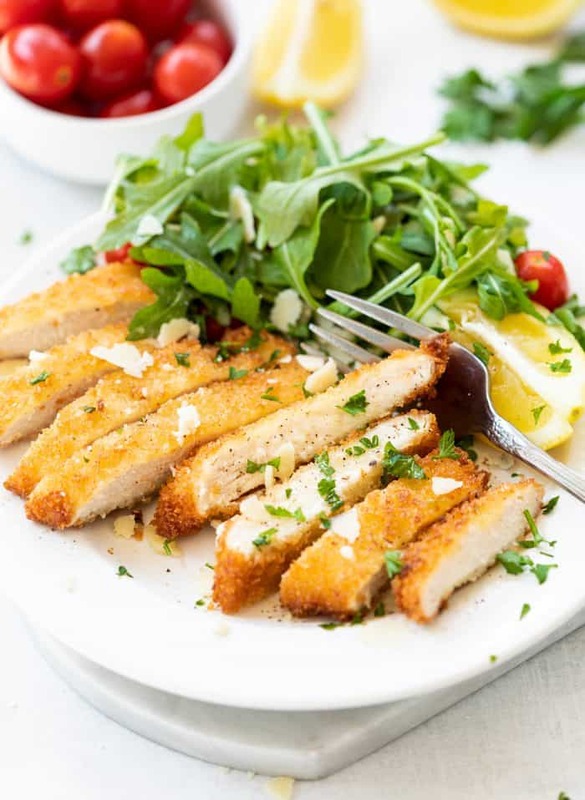 This Chicken Milanese has thin slices of juicy chicken covered with a Parmesan breadcrumb mixture and pan fried to crispy perfection. Simply add a squeeze of fresh lemon, shaved Parmesan, and a fresh green salad! 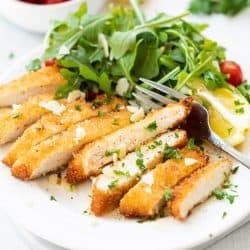 Chicken Milanese is probably my all-time favorite meal to prepare in bulk. 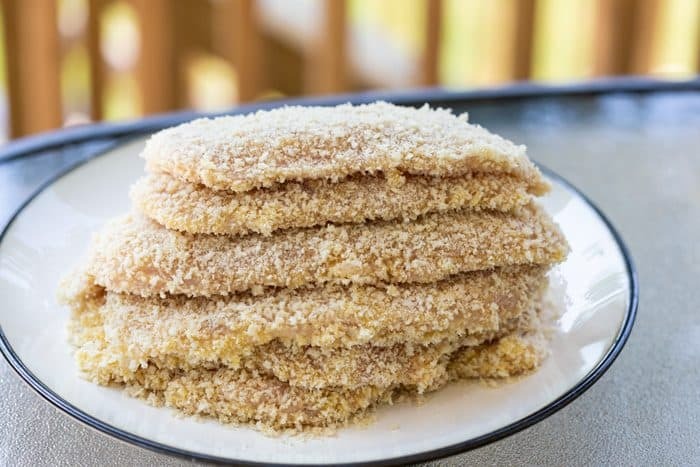 If I’m going to go through the trouble of breading chicken, (which isn’t necessary hard or time-consuming, but it can be messy), I’m going to make a ton of it. 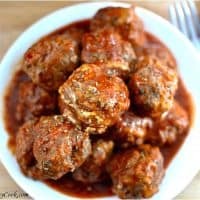 My freezer is always full of this stuff, and there are tons of different ways that I like to serve it to keep things interested! But first, what is Chicken Milanese?! 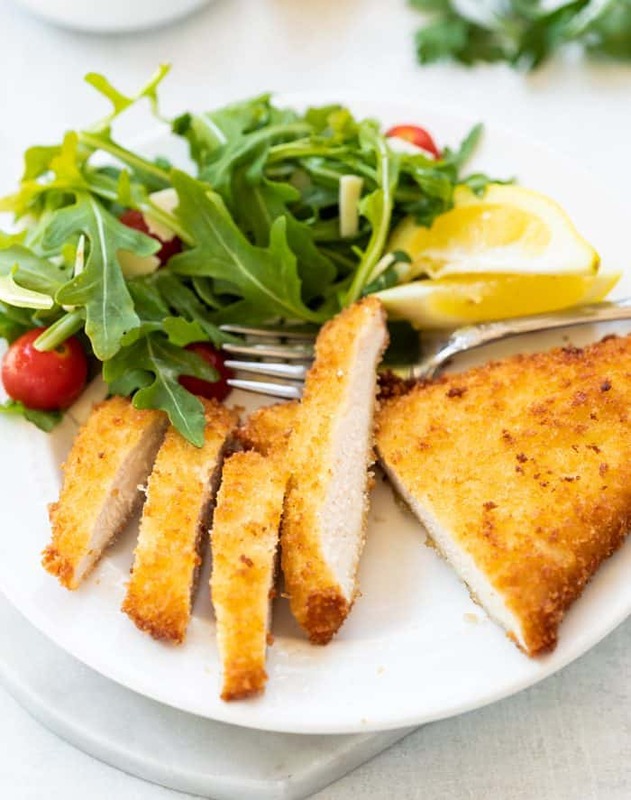 Chicken Milanese is simply thin slices of chicken that are covered in a simple Italian breading mixture and pan fried on the stove-top until crispy and cooked through. 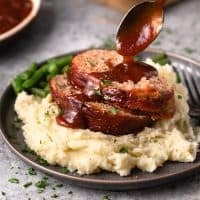 It’s often served with a lemon wedge and simple green salad, but other sauces and sides can also be served with this meal. -Cook the chicken a touch higher than medium heat, and for only about 3 minutes per side. This will crisp up the outside but won’t completely cook the inside. -Let the chicken cool and refrigerate for up to a day. 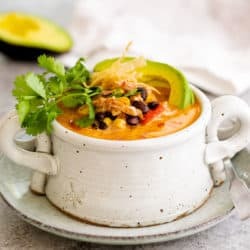 -When ready to serve, place it in a covered casserole dish or dutch oven, (which conducts heat perfectly), and cook for 20 minutes. 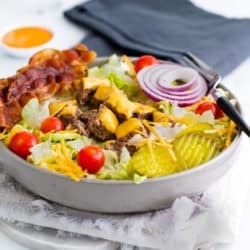 Remove the lid, cook for another 5 minutes, and serve! Bread all of the chicken and fry it a touch higher than medium high heat for about 3 minutes per side. 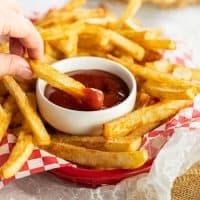 This crisps up the outside but the inside still needs cooking. -Let the chicken cool, flash freeze the cutlets for 15 minutes, wrap them in plastic wrap and stack them in a Ziploc bag. -Freeze for up to 3 months. To serve: Let the chicken thaw in the fridge. 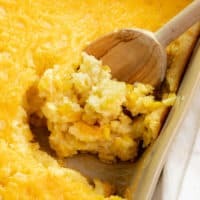 Bake in a covered casserole dish or dutch oven at 350 degrees for 25 minutes. Remove the lid, and cook for 5 additional minutes. Serve! 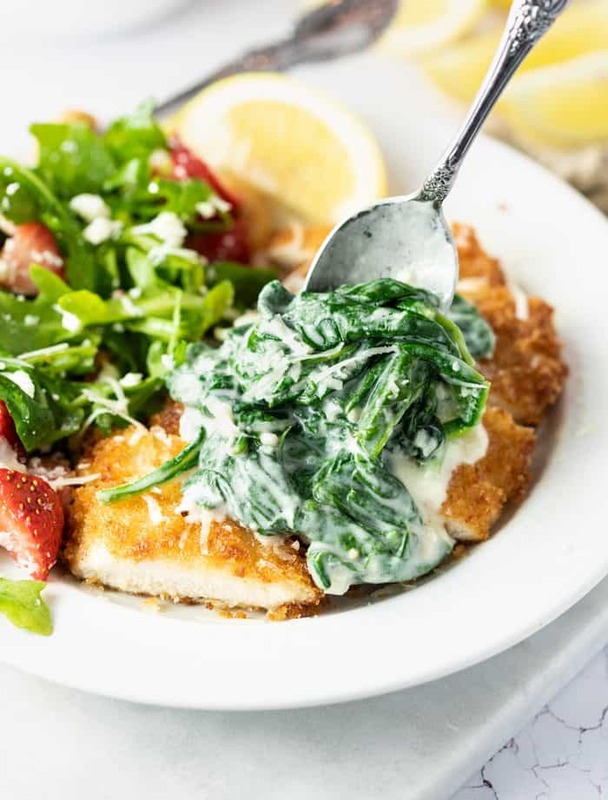 Aside from a classic lemon wedge, shaved Parmesan, and a simple green salad, Chicken Milanese is a great with creamy sauces or even creamed spinach. I often bake this chicken and serve it with Spaghetti for Chicken Parmesan. 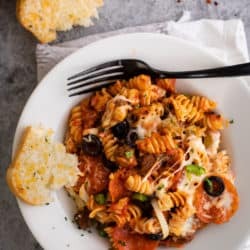 During the last 5 minutes or so of cooking, I drizzle marinara sauce on top and add mozzarella, then bake until the mozzarella is hot, bubbly, and begins to brown. 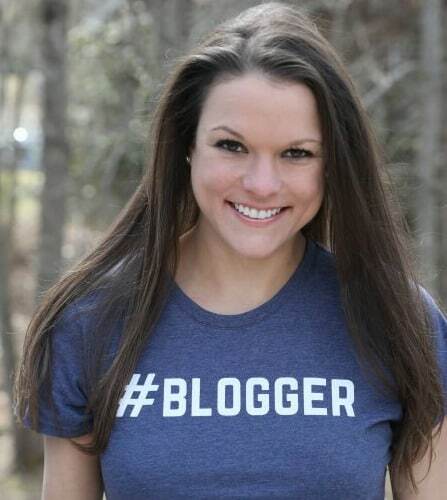 Like my Facebook Page– I share delicious recipes from the best food bloggers. Follow me on Instagram. I love creating Instagram stories to keep you updated on what I’m doing! Follow me on Pinterest. 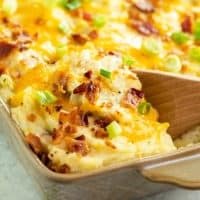 I love to pin new recipes ideas! ¼ cup Parmesan grated. High quality if possible. Butterfly the chicken and cut the seam to create two thinner halves of approximately equal size. Lightly season with salt and pepper. Create an assembly line for breading the chicken. 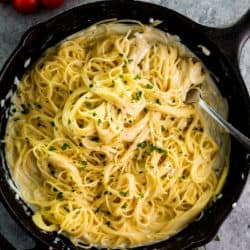 Begin with a placing the flour on a plate, the whisked eggs in a bowl, and mix the breadcrumbs and grated Parmesan together on a plate. Take the first piece of chicken and dredge it into the flour until each side is coated. Dip each side of the chicken into the egg bowl until each side is covered, but don’t overdo it or the flour layer will start to come off. Finally, thoroughly coat each side of the chicken in the Parmesan/breadcrumb mixture and set aside on a clean plate. Repeat for all pieces of chicken. Heat the vegetable oil in a skillet over medium heat. Add two pieces of chicken at a time to avoid over-crowding the pan, space is needed in between the cuts of chicken to ensure that they are extra crispy around the edges. Once each side is a nice golden brown, remove it from the heat and repeat with the other 2 pieces of chicken. Serve with shaved Parmesan sprinkled on top, a fresh salad, and a lemon wedge! *When I prepare these to freeze in bulk, I cook the chicken over slightly higher heat for a shorter amount of time. 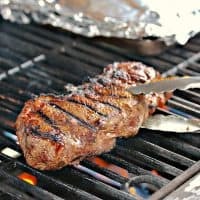 This allows to outside to crisp up, but the inside doesn’t cook all of the way through. Then I let it cool and freeze it in Ziploc bags. 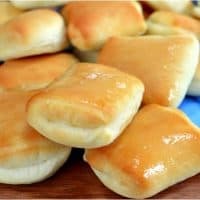 When I remove it from the freezer, I let it sit until it’s no longer frozen but still cold, and bake it at 350 degrees, covered, for 25-30 minutes. On IG you gave a hint on how to keep your chicken breast moist. With the kosher salt & sugar. However you didn’t say how much water to add. I find the Breast meat to be dry that’s why I don’t like it sometimes. Please tell me how much water. Because I’m trying to lose weight & the skinless Breast is best for that. Dear Stephanie, I am an Italian guy. Just wondering if I can freeze the chicken milanese up to 6 months. Actually in Italy we do not freeze it, not even for one day. Hi Angelo, this is best if used within 3 months of freezing, but you can freeze for 6 months, I have and it’s been fine! I’m sure it’s not a common practice in Italy 🙂 But definitely nice when you’re in a bind for dinner! Have a great day!